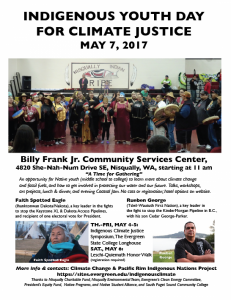 The Leschi-Quiemuth Honor Walk on Saturday, May 6 is an annual event for Nisqually tribal members, joined by supporters, to access cultural sites and former homesteads on the reservation land within Joint Base Lewis-McChord (JBLM). 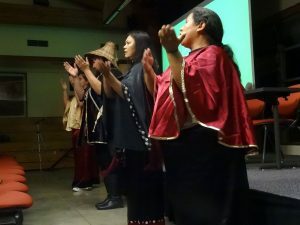 Sunday, May 7 was devoted to the Indigenous Youth Day (including Native and Pacific Islander youth) and was for middle school, high school, college-age students, Indigenous youth group members, and canoe families. The Northwest Indigenous Youth Day included talks on climate change resilience, art projects, youth role models talking about protecting their communities, sharing inspiring and hopeful success stories and skills, having traditional foods and a Coastal Jam, and keeping in touch with other youth protecting their land and water. * Listening to role models talk about their experiences on the frontlines of protecting their communities. * Sharing inspiring and hopeful success stories. * Sharing skills (banner making, music events, etc.) to develop their own skills for change. * Integrating culture into the day, including traditional foods and a gathering by the Salish Sea. * Forming some kind of network of Indigenous youth to communicate and work together on climate and fossil fuels until the next gathering, and working with existing networks. From I-5 Exit 116: Exit on Mounts Road. Follow Old Pacific Hwy SE south to Hwy 510 (Yelm Hwy) and turn left to Nisqually Indian Community. 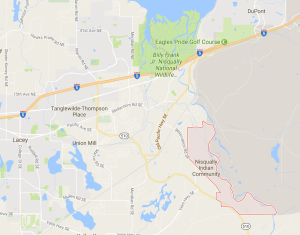 From I-5 Exit 111: Take Marvin Road exit, take it south to large roundabout and turn left on Hwy 510 (Yelm Hwy) to Nisqually Indian Community. 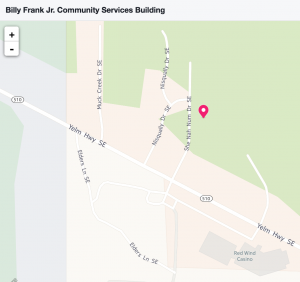 In Nisqually, near the Red Wind Casino, turn left to the gym at 4820 She-Nah-Num Drive SE. Our thanks for the support from the Nisqually Charitable Fund, Clean Energy Committee (Evergreen), President’s Equity Fund (Evergreen), Nisqually Environmental Team, and South Puget Sound Community College.